Dayna Hilton joined the fire service in August 2000 and currently serves as Johnson County RFD #1’s Public Fire and Life Safety Educator in Clarksville, Arkansas. 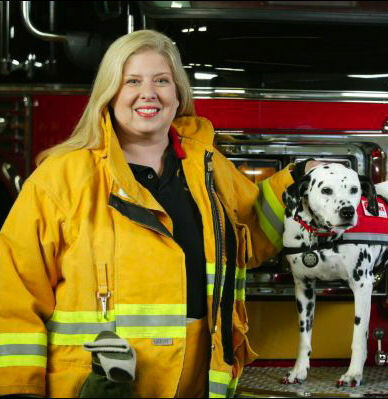 She is the owner of Firehouse Dog Publishing, LLC and the author of the children’s fire safety book and audio book, Sparkles the Fire Safety Dog. Firefighter Hilton was appointed by former Governor Mike Huckabee in 2005 to serve on the Arkansas Fire Prevention Commission. She serves as a Deputy Fire Marshal for the State of Arkansas and is a Professional Member of the Technical Committee of National Fire Protection Association where she serves on the 1035-Standard for Professional Qualifications for Public Fire and Life Safety Educator Committee. She also serves on the International Fire Service Training Association Validation Committee for the Public Fire and Life Safety Educator manual. Firefighter Hilton is an International Fire Service Accreditation Congress certified Public Fire and Life Safety Educator II and Firefighter II. She is an adjunct instructor for the Arkansas Fire Academy, a contract instructor for the National Fire Academy and a member of the Fire Corps Speakers Bureau. She is the state educator contact for the National Fire Protection Association for the state of Arkansas and a member of the Home Safety Council's Expert Network. Under her guidance, Johnson County RFD #1 firefighters and Fire Corps members were honored with the Arkansas Fire Prevention Commission’s Carnahan Award in 2005 and 2006. The award is given annually by the Commission to an Arkansas Fire Department for recognition of excellence and achievement in the field of Fire and Life Safety and Fire Prevention. Other awards received by the department and its Fire Corps include the National Volunteer Heart-Healthy Firefighter Program Appreciation Award, the Gold 2006 and 2007 President’s Volunteer Service Award, the Best Program Extreme Makeover Award at the 7th Annual Fire, Burn and Life Safety Conference, and the Daily Points of Light Award as the Nation’s Volunteers of the Day on June 8, 2006, sponsored by the Points of Light Foundation. Hilton was awarded the 2006 National Volunteer Fire Council’s Fire Prevention Award. The award is bestowed to a “volunteer who exemplifies the philosophy of fire prevention through their contributions to the field”. She was recognized as a Dunkin’ Brands Community Foundation Hero in July of 2007. In 2008, Hilton was selected to participate in Vision 20/20, the gathering of over 170 experts from across the country to meet in Washington, DC, to develop a national strategy for fire loss. In 2007, she was selected by the Home Safety Council as a resource to the Home Safety Literacy Project program. That same year, Hilton was selected to participate in the National Fallen Firefighters Foundation’s National Prevention Mini-Summit in Washington, DC. She was selected to present at the general session of the Home Safety Council’s All-Ways Safe at Home Conference in Washington, DC in January 2007. Hilton has made presentations at the National Fire Protection Association’s World Safety Conference, Fire Rescue International, and numerous presentations on the national level. She has authored articles for Fire Engineering Magazine, the National Fire Protection Association Journal, Firehouse.com and podcasts for Firehouse.com and First Alert. For her work with the novelty lighter issue, Hilton’s photo appeared in the United States Fire Administration’s 2008 Arson Awareness Week campaign materials. Two of Hilton’s fire safety photos were chosen to appear in the International Fire Service Training Association’s calendar in 2006..
During 2006 Fire Prevention Week, Hilton hosted “Fire Safety Tips” on PBS KIDS Sprout, the first and only 24-hour preschool destination available on television. Assisting Comcast in the fire safety content of the PBS KIDS Sprout webpage, her efforts reached children online ages 2-5 and their parents and caregivers. In September 2006, she appeared live on FOX and Friends in New York City promoting fire safety, reaching almost one million viewers. In 2008, she and her dog, Sparkles, appeared on television on the following stations: WXIN and WTHR in Indianapolis and WLS in Chicago, and in the following newspapers: the Chicago Tribune, The Lisle Sun and others, and the following websites: the Chicago Tribune, the Baltimore Sun, and numerous other websites. 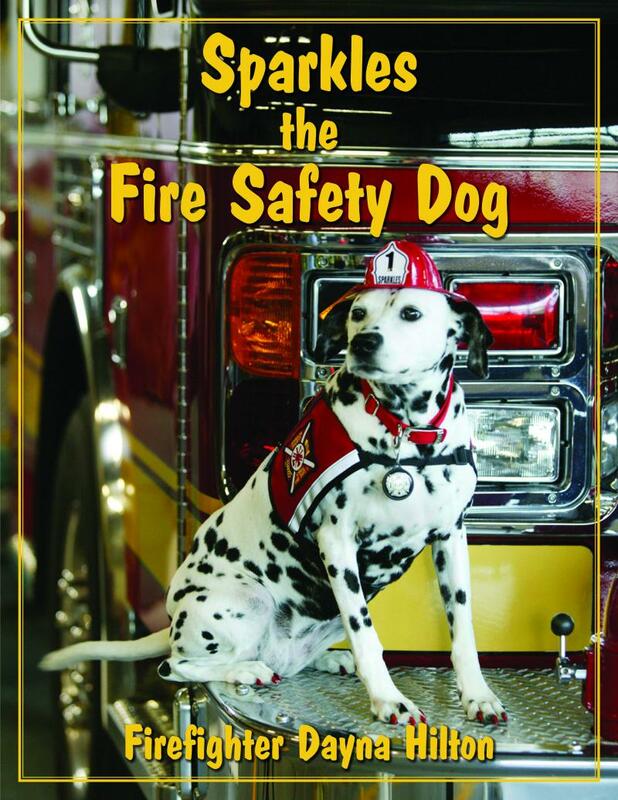 In 2007, after a national "Star Search" of Public Fire Educators by the Research Division of Fire Protection Publications at Oklahoma State University, Hilton was chosen to play the female lead in the educational video, Presenting Fire Safety Messages to Young Children. This educational video will be a multifaceted educational tool and companion piece to an extensive fire safety educational curriculum for young children 4 and 5 years old. The video includes instructional material for teachers, young children and firefighters. In 2002, Hilton was selected to play her pipes in the honor guard at the National Fallen Firefighters Foundation Memorial service for 911 victims in Washington, DC, and played her pipes in the video for first responders, “We Respond.” This video received a Communicator Award in 2003. An advocate for promoting fire safety, Hilton finds it her life’s passion to keep everyone fire safe.